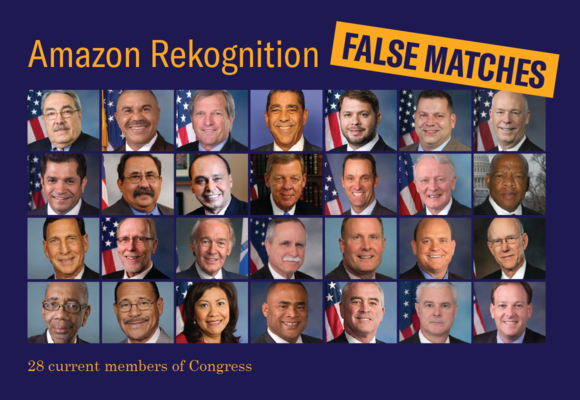 After learning that Amazon was pushing the use of Rekognition, its facial recognition tool, for use in policing (a global phenomenon that is gaining momentum despite the material unsuitability of these tools in policing contexts), the ACLU of Northern California had a brainwave: they asked Rekognition to evaluate the faces of the 115th Congress of the United States. Rekognition indicated high confidence that 28 members of the current Congress were known arrestees. It was wrong in every case. The false positives disproportionately targeted racialized members of Congress. This, finally, has Congress's attention: members of Congress have sent some pointed questions to Amazon about its Rekognition tool and given them a deadline of Aug 20 to respond. They've also requested an immediate meeting with Jeff Bezos to discuss the topic in depth.